The latest issue of German game mag PC Games reveals that the final two Star Wars: The Old Republic classes will be the Jedi Consular and the Sith Inquisitor. A-hem. I would like to refer back to the news post I wrote when BioWare unveiled the Jedi Knight class in SW: TOR at the end of last month, where I hazarded the prediction that we could very well see a "a caster-type Sith" as well as the already-announced Sith Warrior. Can I just toot my own horn for a moment and say: nailed it! The Inquisitor and Consular were revealed in German game magazine PC Games, and in lieu of a proper reveal on the TOR website, there's a translation of the article over on the game's official forums. From the descriptions given, both classes are second-line fighters, with the Jedi Consular given the option to choose between damage-dealing and healing (If I know my MMOG communities, guess what they'll be doing in groups?) and the Sith Inquisitor an area-of-effect damage-dealing class with some crowd control support abilities. The Consular gets to put people to sleep and presumably throw heavy objects at them with the Force, while the Inquisitor lets players live out all of their dark fantasies of being the Emperor and shooting lightning out of their fingertips. It's probably also a way for BioWare to ensure that the game isn't overrun by Jedi Knights and Sith Warriors on day one - or at least, not as overrun. So, now that all the classes are revealed, this makes the full roster: Trooper, Smuggler, Jedi Knight and Jedi Consular for the Republic, and the Bounty Hunter, Sith Warrior, Imperial Agent and Sith Inquisitor for the Sith Empire. Sounds like a hell of a time. 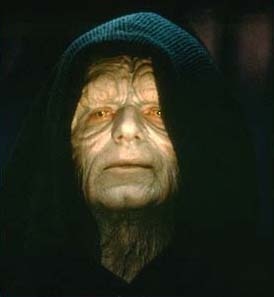 Does the Sith Inquisitor class make you all wrinkled and twisted like Palpatine here? That could be the make-or-break question, really.